Alan Trout's Tobin Hill Turning Studio is based in the Tobin Hill neighbourhood of San Antonio, Texas. His woodturnings include a surprise element: resins are cast in wood burls, root balls and other found organic material to create what he likes to call 'Syntho-Organic' forms. 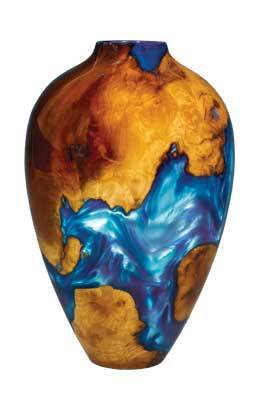 Alan's pieces can be found in some of the finest private wood art collections and galleries in the USA. Alan grew up in a small community just northeast of San Antonio, Texas. His father was a U.S. Air Force pilot at a nearby air base and he had a loving stay-at-home mother who tried to keep Alan and his brother out of trouble. His childhood had a perfect blend of rural and urban activities. "My brother and I spent our time foraging along Cibolo Creek, hunting and fishing when we could. It was a great place to grow up. We had plenty of exposure to rural life, but were close enough to the city and the cultural opportunities that only a big city can offer. San Antonio is a city steeped in history older than the United States itself, and is always a great place to visit. Between museums, the zoo, the missions and other historical sites, it was always a fun place for a kid. I enjoyed the inner city so much I have called the north end of downtown San Antonio home for more than 20 years." After retiring from the Air Force, his father became an industrial arts and building trades instructor. He has clearly had a great influence on his son. "He is an incredible individual and undoubtedly one of the most mechanically talented individuals I've ever met. There was just nothing he could not do. I like to think that many of my abilities were either inherited or learned from my father. He instilled a serious work ethic in me and taught me many of the skills I have today. My father and mother always encouraged me to take on new challenges." Alan has had a varied professional life: he started college as an architecture student but then decided to become an entrepreneur. He owned and operated a machine shop before working as a representative for a machine tool company, and is currently self-employed as a private building inspector. However, he has always enjoyed working with his hands. "I could not imagine what life would be like if I could not do something creative with my hands. Today I say I have two jobs: my day job, which allows me the opportunity to explore my imagination in my night job." His family offers encouragement for this night job. "My wife of 20 years is a creative metalsmith, and has always supported me in my endeavours with rarely a complaint. My nine-year-old son is a great kid who is starting to show interest in our creative processes." With his machine-tool background and love of creativity, getting into woodturning was a natural progression for Alan. "Turning was a perfect fit. I love tools and machines. Not many types of art have the need for equipment that we have. It is a tool junkie's dream." He explains that the book 500 Wood Bowls was what really 'sent him over the edge' with woodturning, "I was fascinated by all the beautiful and unique objects that filled that book. I knew that I could learn it. My family bought me a mini lathe for Father's Day in 2007, and it took off from there. Of course, like many, I quickly outgrew that lathe and I have collected several others since." The 'Syntho-Organic' form is what sets Alan's work apart and it is a style that he developed fairly early on in his woodturning career. "When I started turning, I had an idea of what I wanted to do. I had seen resin casting, which really intrigued me, but it was generally on a small scale. 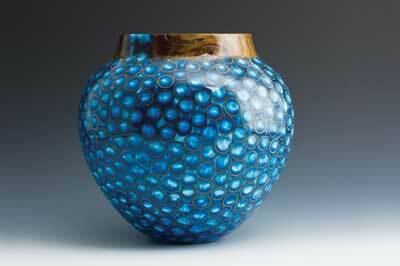 At that time, I decided I would focus on vessels that incorporated resins and coloured pigments into my pieces." His pieces have classic forms, but with a modern twist. "While I often draw on shapes from antiquity, I feel the way that I incorporate and blend resins, pigments and organic materials into my pieces really gives them a contemporary art aesthetic." His style also includes a bold use of colour. "Some people think that colour detracts from wood's natural beauty. I am of the school of thought that believes colour brings wood and organic materials to life. It enhances and accentuates the beauty of those natural materials." Alan's work has evolved over the years to become something unique. "I think there is a natural progression for most turners. It is a lot like a child learning. We start by copying our parents, and as we get older we start to have our own distinct personalities and ideas. I started out copying things I saw in magazines and online. This is what allowed me to develop the skills and confidence to progress to the pieces I envisioned. Today, I think that the pieces I make are distinct enough that people recognise them as mine. Many call this 'Their Voice'. I think I have found mine," he says. This style features a lot of contrasts, between natural and synthetic materials, different colour combinations and different values, such as having a gentle arch terminated with a sharp edge. Alan believes this is what makes his work so appealing. "Contrast attracts the eye and makes for interest. There are many ways to incorporate contrast into a piece and often I will employ multiple contrasting elements." 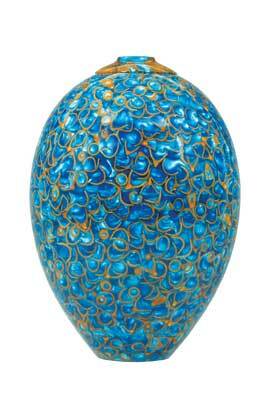 He plans to continue developing his style by including different textures, metals and finishes in his pieces. He also has ideas for incorporating many new techniques and materials, it is just a question of finding the time to bring these ideas to fruition. "I hope to make some more sculptural pieces. However, just perfecting some of my current processes is my primary concern at the moment." His inspiration to keep working comes from within. "I think I have selfish motives. For me, the satisfaction is in the process of making an object from a concept to a completed piece. Knowing that I did my best is all the inspiration I need. Making is as important to me mentally as food is for my body. Sitting back and looking at a well-executed piece and saying 'I made that' is the inspiration for me to make another. 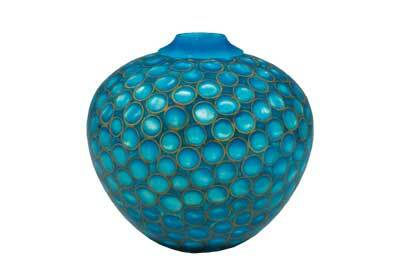 I make objects for my own personal satisfaction, when others enjoy them, it makes it all the better." Alan cites his environment as his greatest influence. "I consider myself to be an observant person. I draw influence from the textures and objects I see around me. Both textures I see in nature, and objects I observe in a museum have influence." Even a block of stone can be a source of inspiration. "I once had a client laugh at me for staring at length at an interestingly patterned slab of granite. It was just mesmerising. It was like looking into a night sky. All of these shapes and patterns I see influence the pieces that I make. I see the abstract in my environment." Alan has worked hard to create his well-equipped workshop, which he describes as his "ultimate man cave" complete with pretty much every tool he needs for wood and metal work. His workshop is in a 7.6 x 9m two-storey wood-frame building with an apartment on the first floor. He has three full-size wood lathes, the primary lathe is a longbed Robust American Beauty, the others are a Nova DVR XP on a custom fabricated stand and a shortbed Woodfast lathe. He also has a combination woodworking machine for his rare pieces of flat work. Other tools include two wood-cutting bandsaws, one 620mm and the other 355mm; a 430mm drill press; a 305 x 925mm metal lathe with two axis digital readout; a metal milling machine with three axis digital readout; a 200 amp tig welder; a 50 amp plasma cutter; a 180 x 305mm horizontal metal-cutting bandsaw; a 150 x 1,220mm belt sander; and a benchtop spindle sander. Not to mention the various hand tools, compressor, air filtration, etc. "Basically I have run out of space for machines!" he says. As you can see, this is a workshop that is designed and equipped for a real turning enthusiast. Alan tries to work on something related to turning everyday, whether it is a piece, a tool, planning, sketching or research, although on most days he canâ€™t do as much as he would like to. "Finding time for my day job, my night job and my family is always a balancing act. I like to work. I enjoy getting up everyday knowing I have responsibilities and things to do." The time taken to complete a piece depends on its size. 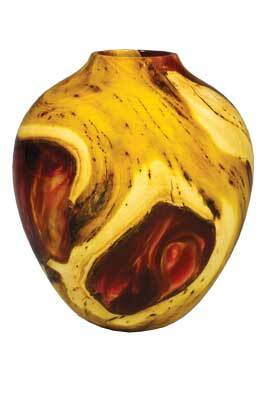 "The smaller acorn cap pieces in the 100 to 150mm range take between 40 and 60 hours. The larger pieces take from about 80 to over 100 hours. Over two-thirds of this is bench time with the rest being turning and finishing of the piece." 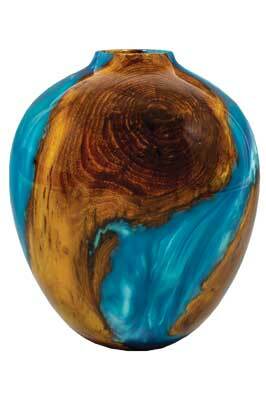 So far, Alan's woodturning career has been a pretty fast progression without a lot of lows. The biggest high to date was when his piece 'Simplicity' received an award of excellence at the National Symposium in Tampa, Florida. "Having a piece selected for excellence by your peers and collectors at a premier turning event is an incredible feeling. I was speechless and taken completely by surprise. For me, it was a validation of the effort I put into my pieces. I would do it without the recognition, but having it is really nice." For Alan, the camaraderie in woodturning is the most "amazing" thing about it. "It transcends nationality, religion, race and economy. When I meet another turner as a stranger, we are instantly friends. It for sure is one of the most sharing groups I have ever been associated with," he explains. The only low so far came when he first started turning as he did not have the skills to make what he envisioned, but that was easily resolved by just spending more time at the lathe. The internet is a useful promotional tool for Alan, he has his own website and also frequents several turning forums and regularly posts his pieces there. He enters a few shows and contests, and travels to at least two symposiums a year. He also shows his work in select galleries and is a member of both the American Association of Woodturners and Collectors of Wood Art. "Supporting these organisations is, in my opinion, both crucial to the advancement of our art and ourselves as artists and craftspeople," he tells us. "My days are not very exciting. I am like most people, I get up between 6 and 6.30am, take my son to school and do my preliminary paperwork for my day's inspection business. I typically do two inspections a day and finish my field work between 4 and 6pm. I will have about another hour of paperwork and then head into my shop. Depending on the piece, I could be working on the lathe or bench. I will do this until about 11pm or 12 am and then sit down for about 30 minutes before going to bed, and it all starts over in the morning. On weekends or days off, I will get into the â€™shop about 9am and work until I canâ€™t any longer. I have done days from 9am to as late as 2am the next morning, with occasional food and drink breaks." Alan's main aim for the future is to make more art, but to do this he will need more time. And he has come up with a practical way to achieve this. "I have developed and am starting to produce a very unique hollowing device. I hope the sales of these tools will take some of the income pressure off of my inspection business and allow me to spend more time in the studio. Hopefully, even replacing the day job entirely." 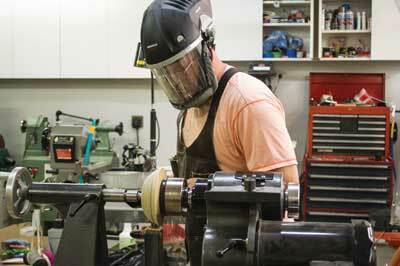 This hollowing rig has become an indispensable tool in his workshop. "The hollowing system that I designed is just such a pleasure to use. It works as well on a small 100mm or 500mm deep piece. Having done my fair share of hand-hollowing and having used and owned other types of captive rigs, there were times that I would lose a piece to a catch, or through not paying attention. When you lose a piece that you had spent over 50 hours on before it reached the lathe for hollowing, it hurts. This system has virtually eliminated loss from hollowing errors." He has also been doing some teaching in his studio, which he enjoys and hopes to do more of. He has ambitions to build a private studio for himself with a teaching studio to accommodate three to five students at a time. So, as you can see, Alan Trout is a woodturner with serious ambition and drive. His future looks set to be full of more explorations into producing pieces that push the turning envelope. We wish him all the best. Plan your project: I first develop an idea in my head and then I sketch it on paper. I determine the proportions, colours and materials needed and then start my piece. Things can always be changed but having a direction when you start will help keep you focused on the task needed to complete a successful project.